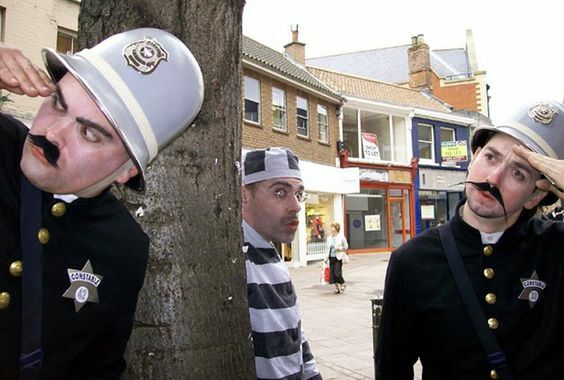 Inspired by the black and white Keystone Kops silent movies from the early 1900s, this show takes the classic original concept of the Keystone Kops and brings them back to life after almost a century absence. 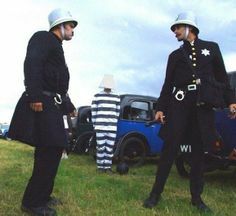 The bungling Keystone Kops as hard as they try are (as ever) incapable of apprehending their quarry the elusive escaped convict Slippery Jack. 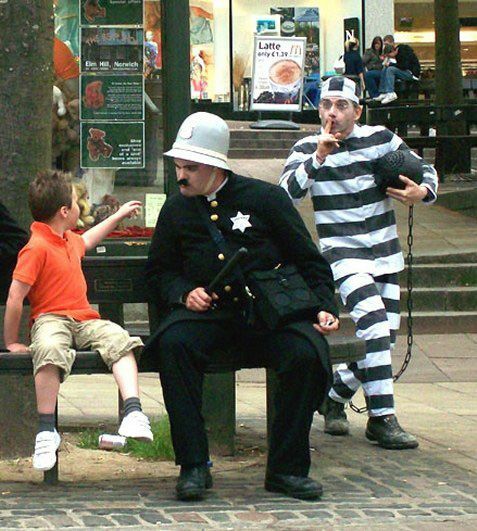 On the run from law and order with his ball and chain in tow, Jack outwits the Keystone Kops at every twist and turn with his nimble guile and cunning disguises, who would ever suspect a standard lamp, or that man with the impossible moustache? 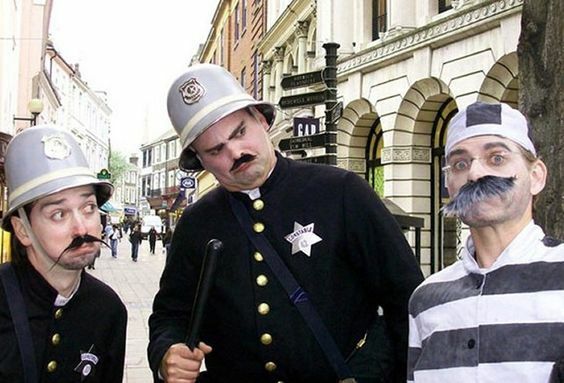 Could those Keystone Kops really be even more stupid than they look! 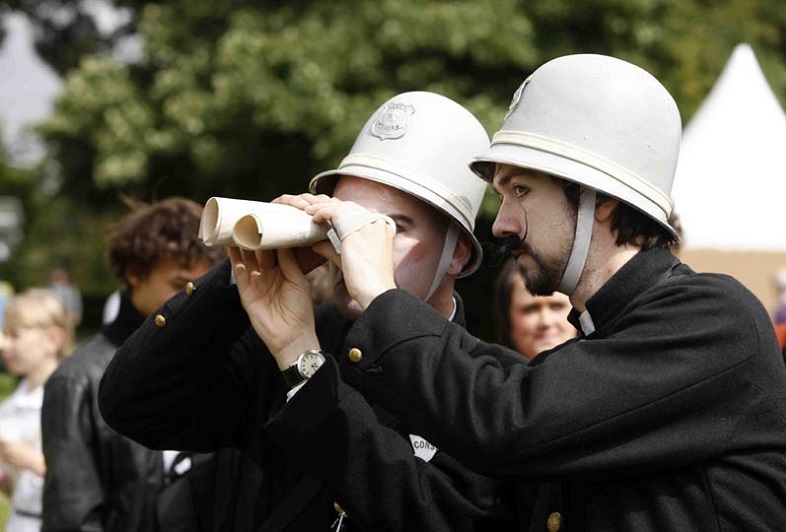 Frustrated beyond their limits of self control, the incompetent Keystone Kops pass the buck of blame to and fro with escalating vim and vigour, it wont be long before their truncheons are drawn but maybe not for Jack!! 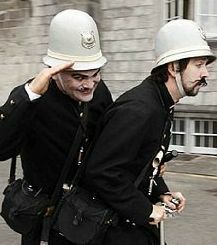 And so Constables Mouton and Blewit on their pocket sized police scooter, chase their tails in increasingly bewildering disarray, as Jack escapes their clutches one more time. 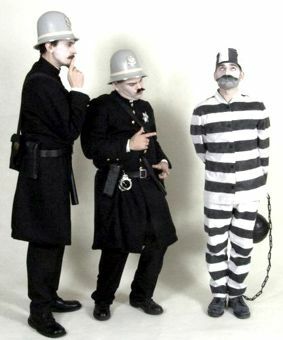 In keeping with the silent movie era, the Keystone Kops are a faithful reproduction of the original farcical slapstick films from the Keystone studios, but it is performed as black and white silent theatre, a mime based physical theatre walkabout show, but with each Keystone Kop controlling their own musical accompaniment and slapstick sound effects. Authentic Rag Time music is used, amongst an array of evocative sound effects, and scene setting piano scores. Each performer has a concealed state of the art miniaturised (but loud) personal PA system with remote controller. This arrangement gives each Keystone Kop superb improvisational control, freedom and flexibility to set their own scene and mood, or the ability to execute tightly choreographed sequences. 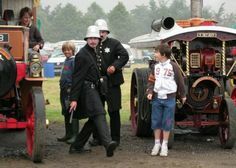 The PA are extremely high quality purpose built systems concealed within either shoulder bags, or the convicts ball and chain. Edmond accidentally finds himself trapped in a perpendicular world of absurdity, where the bizarre is always close on his heels. Amidst a reality of swarming angry bees, spaghetti western gun fights, alarm bells, improbably large monsters, ringing telephones, crashing glass, low flying helicopters, packs of hunting hounds, squeaky prams etc etc…. he attempts to keep his composure. Visionary fashion gurus Carpet Man and Lino Boy bring their inimitable 21st Century couture creations to the catwalk of the pavements. Having lived through the colossal highs and the bottomless lows of the retail carpet trade, Carpet Man has seen the future of fashion. Drawing on the skills of the family’s most resourceful nephew – Lino Boy – Carpet Man and his side kick proudly present their astounding culture creations to the world, fresh from the ‘Garden Shed Studio’.